Since the EPA announced stricter emissions regulations for wood and pellet stoves, prices increased by an average of 3% over a two-year period when adjusted for inflation, based on a review of 77 popular stove models. Without inflation, prices increased by an average of 4%. 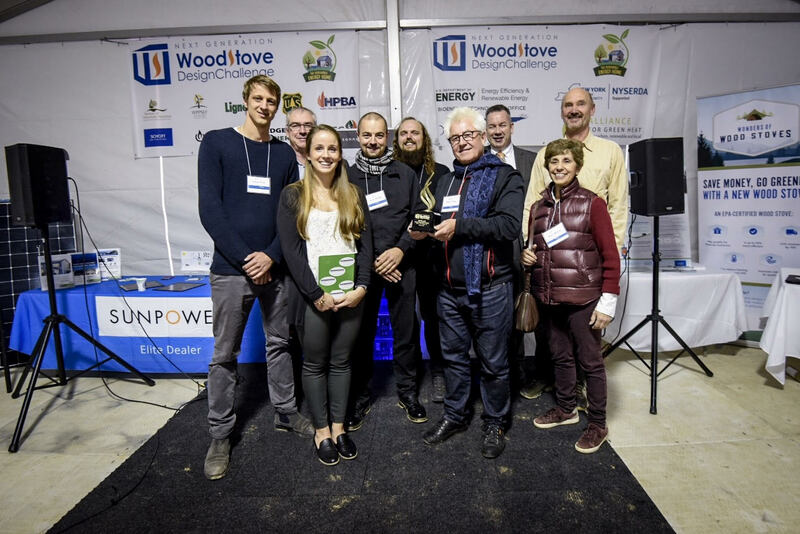 The Alliance for Green Heat, an independent non-profit focused on the wood and pellet heating sector, tracked retail prices for 77 wood and pellet stoves over a two-year period, from February 2015 to February 2017. The EPA announced new regulations on February 3rd and they took effect on May 15, 2015. Even stricter emission limits are set for 2020 and the Alliance will continue to track prices through 2020 and beyond. We identified 77 stoves made by 7 popular brands with varying price points: Jotul, Blaze King, Harman, Quadrafire, Woodstock Soapstone, Hearthstone, US Stove, and Englander. It is impossible to tell how much regulations contributed to the 3% price rise, although each of the 7 brands are going through periods of increased R&D as they work towards complying with the 2020 emission limits. The EPA set a maximum of 7.5 grams an hour in 1990, 4.5 in 2015 and 2.0 or 2.5 grams in 2020. Most stoves already met the 4.5 gram limit in 2015, but most do not meet the 2020 limits. It is possible that some companies are starting to pass those costs along to consumers. There may be steeper price rises as 2020 approaches and companies have to begin more intensive R&D and certification testing. However, industry is pushing a bill in Congress to delay the 2020 emission standards to 2023. The Hearth, Patio & Barbecue Association is also suing the EPA to block the 2020 emission standards for boilers and furnaces, but not necessarily for stoves. The bill in Congress is partially designed to give the litigation enough time to get through the courts. We tracked the retail prices of 59 wood stoves and 18 pellet stoves using the sale or final price of the stove listed on the retailer’s website. Overall, the 59 wood stove retail prices rose an average of 4% ($80) or 3% ($45) when accounting for inflation. The pellet stove category saw a greater average price increase of 5% ($106) or 3% ($66) per stove when accounting for inflation. Four-fifths of the 77 wood and pellet stoves increased in price over the two years. Of these, the average price increase was 6% ($125) or 5% ($90) when adjusting for inflation. About one-fifth of the 77 stoves did not go up in price between February 2015 and 2017. The majority of the Englander and Blaze King models we tracked stayed the same price. Four wood stoves out of 77 wood and pellet stoves -- one Jotul, two Hearthstone, and one US Stove -- declined in price. The average decline was 6% ($250). The EPA is required by law to do an economic regulatory impact analysis (PDF) and determine if the costs of the regulation outweigh the benefits. The EPA predicted slightly higher retail costs, and as a result, a slight decline in demand for new stoves. However, on balance they estimated that the overall health and other benefits vastly outweigh the costs. Some commentators, members of Congress and editors claimed the EPA regulations would make wood stove prices rise sharply and be unaffordable for the average American. The EPA also is required to assess the impact of the regulation on small businesses, since more than 90% of stove manufacturers and retailers are small firms. The U.S. Census Bureau reports that the industry employed 15,911 workers in 2011. The wood stoves with the highest price decreases, Hearthstone’s Bari 8170 and Lima 8150, which declined in price by $620 and $300 respectively, were the priced the highest of any stove on our list in 2015 at $4,999 and $5,299. No pellet stove we tracked declined in price in 2017 and the only two pellet stoves did not increase in price in 2017 (both Englanders priced between $1,000 and $2,000). Wood stove price increases ranged from 1% (Hearthstone Castleton 8030 and Craftsbury 8391) to 35% (US Stove’s Large Woodstove). Among the wood stoves that increased in price between 2015 and 2017, the average increase was around $125 or 6% more than the 2015 price. Seven of the nine pellet stoves that rose in price increased by an even $100, regardless of their 2015 price, which represented a 3-4% increase. All five of the Harman pellet stoves, which retailed between $2,999 and $3,999 retail in 2015, were listed $100 higher by the same retailer in 2017. For the sake of consistency, we only used stove prices at one or at most two retailers per brand. We used final or sale prices rather than “suggested retail price” or “regular price” when given. The number of stoves we selected per brand varied based on the number of models available in 2015 and the number of models that continued to be sold by that retailer in 2017. Englander and US Stove had some of the lowest prices stoves we began tracking in 2015, with a median price of about $1,000. 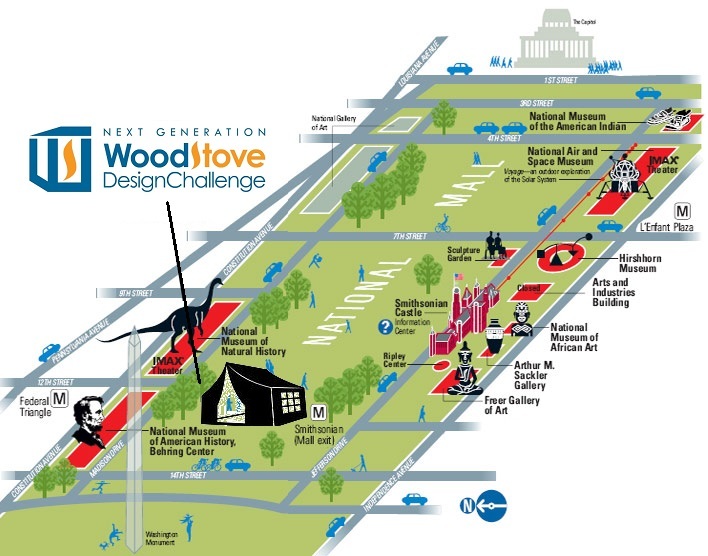 At about the middle were the brands Woodstock Soapstone (median price of $2,400), Quadrafire ($2,550), and Jotul ($2,700). The more expensive stove brands included our study, based on median prices, were Hearthstone ($2,900), Blaze King ($2,950), and Harman ($3,000). Four out of five Blaze King stoves, three out of four Englander wood stoves and all (two) Englander pellet stoves did not increase in price over these two years. The sixteen Hearthstone wood and pellet stoves we tracked declined in price by an average of 1% ($3.75) per stove, thanks in great part to large drop in price for two of the brand’s priciest ($5,000+) wood stoves. As for the brands that increased their prices, Jotul’s 19 wood stoves increased by an average of 3% ($79) each. Quadrafire’s and Harman’s wood and pellet stoves both increased by an average of 4% each ($101 for Quadrafire, $122 for Harman). Harman’s wood and pellet stoves increased in price by an average of $122 per stove. 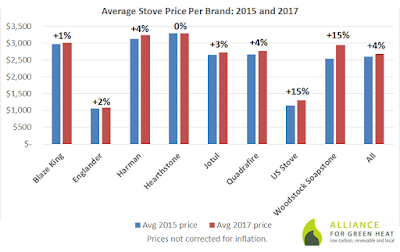 US Stove and Woodstock Soapstone had the greatest average price increases of any brand at 15% each (Woodstock Soapstone has frequent sales which we did not take into account). 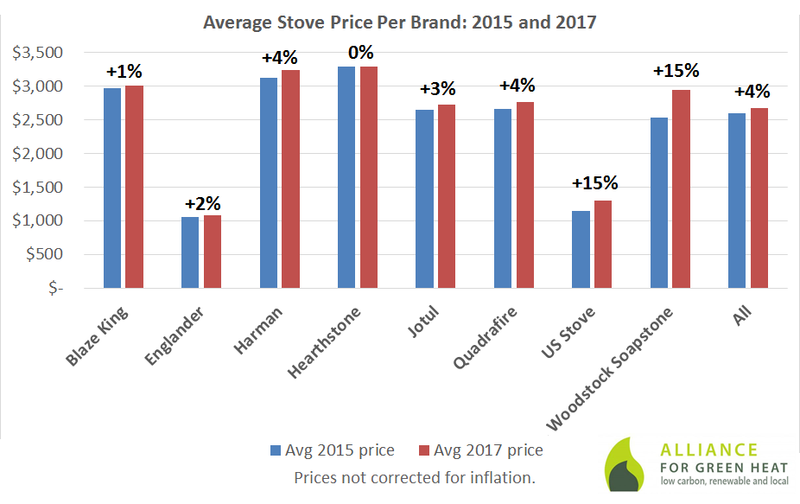 US Stove’s stove prices increased by an average of $155 per stove and Woodstock Soapstone’s increased by an average of $408 per stove. The EPA regulations had a much larger impact on prices on companies making unregulated outdoor wood boilers and unregulated wood furnaces. Prices for boilers rose at a sharper rate than stoves, although we did not track those prices and cannot offer any estimates. The EPA’s new wood heater regulations has left more than 10 states with outdoor boiler regulations that now need updating. Most state regulations refer to Phase 1 and Phase 2 boilers, a voluntary program that has now been superseded by certified boilers in new EPA regulations. Currently, at least New Hampshire and Maryland are updating regulations and the province of British Columbia already incorporated language for the new EPA certified boilers. 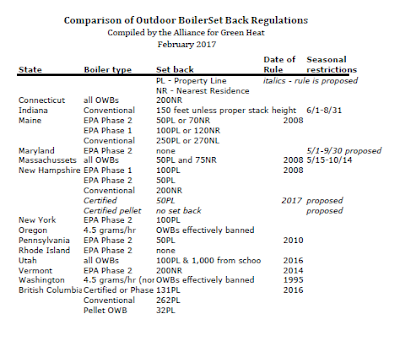 The wording in these regulations is often tricky and several states have created unintentional results in the past, such as Maryland whose regulations only allowed Phase 2 outdoor boilers to be installed, effectively prohibiting the installation of far cleaner and more efficient indoor pellet boilers. Scott Nichols, owner of Tarm biomass in Orford New Hampshire, is working with New Hampshire officials to avoid unintentional results. One issue, for example, is his recommendation to maintain the exemption for outdoor pellet boilers from property line set back rules, an exemption in place since 2010. 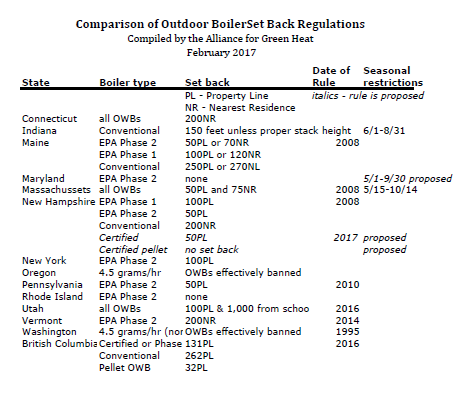 Most states that regulate outdoor boilers have established set backs, from 50 to more than 200 feet. This shows the set back and stack height rules in Fairbanks, Alaska, one of more than 100 towns and counties that established local ordinances, albeit years after many boilers were already installed too close to other homes, schools and business. The Alliance for Green Heat is urging states to retain or establish property line set backs for outdoor wood boilers, including the new certified ones, since they can still emit excessive smoke if they are loaded with unsplit, unseasoned wood. “We recommend a minimum of 50 feet from the property line and 150 feet from the nearest neighboring residence for certified wood boilers and more for non-certified ones,” said John Ackerly, President of the Alliance for Green Heat. Towns and counties with deep valleys or where weather inversions are common will likely need far bigger set-backs. As of mid-February, 2017, New Hampshire is proposing 50 foot set-backs for certified cord wood boilers, but Maryland’s draft did not include any set backs. Another key issue for states is ensuring that only certified outdoor boilers are allowed for both residential and commercial use. Unless states stipulate that all new installations be certified, unregulated boilers could still be installed in residential areas for commercial purposes, such as a chicken house or greenhouse. The EPA does not regulate outdoor wood boilers that are used for commercial purposes. Boiler manufacturers can sell unregulated boilers to homeowners who do not have any registered business, as long as they sign a form saying the boiler will only be hooked up to a greenhouse or garage, and not connected to the home. If the homeowner connects the boiler to the house, the signed form protects the manufacturer from liability. The EPA’s former voluntary qualification program and recent certification program for outdoor wood boilers (hydronic heaters) has helped to reduce particulate matter when the boilers are operated responsibly. In addition to stricter emission standards, most certified boilers now have controls that help ensure better combustion throughout the burn cycle and reduce the impacts of cycling. However, many experts and state and local air quality agencies remain concerned that EPA-qualified Phase 2 and EPA certified boilers can produce excessive smoke in the hands of many operators. One major policy response has been to establish set backs from property lines and/or nearby residences. Most states where outdoor boilers are popular—with the exception of the Great Lake states where most outdoor boiler manufacturers are located—maintain set backs. set backs help ensure that outdoor wood boilers are not installed in densely inhabited areas and even in rural areas, they provide a buffer with the immediate neighbors. Property line set backs: The most common type of set backs are property line set backs. They typically range from 50 to 200 feet, with 100 feet being the most common. Maine, Massachusetts, New Hampshire, New York, Pennsylvania, Utah, and British Columbia all use property line set backs. Set back from nearest neighboring residence: Connecticut and Vermont are the only two states that use set back from the nearest neighbor’s residence. They both require 200 feet, representing stricter rules. Both property line and nearest residence: Maine and Massachusetts use both property line and nearest residence. For EPA Phase 2 boilers, Maine requires 50 feet from the property line or 70 feet from a neighbor’s house. Massachusetts requires 50 feet from a property line and 75 feet from nearest home. Seasonal restrictions: Two states, Indiana and Massachusetts, do not allow outdoor boilers to operate in the summer as they can cause even more pollution in warmer weather when they are likely to cycle on and off more frequently. In addition, Maryland recently wrote draft regulations that would restrict use from May 1 to September 30. Sunset clauses: Most state rules only apply to future installations, but some, such as Vermont and British Columbia, have sunset clauses for conventional boilers. In British Columbia, only EPA certified and Phase 2 boilers can be operated after November 1, 2026. CGS § 22a-174k, enacted in 2005, bans the installation or operation of OWBs that do not meet certain requirements. A violation of the law is an infraction. With a few exceptions, the law prohibits anyone from building, installing, establishing, modifying, operating, or using an OWB until EPA regulations governing them take effect. OWB installations need to meet minimum setback requirements designed to protect public health. The setback distance required depends on the unit’s emission rating, with reduced setbacks allowed for cleaner-burning OWB models. The setback table below lists the minimum distance an OWB unit needs to be from any neighboring property line or dwelling. Buyers should carefully consider whether their property configuration provides the necessary space to meet the setback requirements before purchasing a boiler unit. 1. Site or install a residential-size outdoor hydronic heater that meets the emission standard defined in 310 CMR 7.26(53)(a), unless it is installed at least 50 feet from any property line and 75 feet from any occupied dwelling that it is not serving, at the time of installation. I. No person shall install a Phase I OWHH unless it is installed at least 100 feet from the nearest property line and has a permanent attached stack that is at least 2 feet higher than the peak of the roof of a residence or place of business not served by the OWHH if that residence or place of business is located within 300 feet of the OWHH. II. No person shall install a Phase II OWHH unless it is at least 50 feet from the nearest property line. III. No person shall install an OWHH that is not a Phase I or Phase II OWHH unless it is located at least 200 feet from the nearest abutting residence and has a permanent attached stack that is at least 2 feet higher than the peak of the roof of a residence or place of business not served by the OWHH if that residence or place of business is located within 300 feet of the OWHH. Source. 2008, 362:2, eff. Aug. 10, 2008. All new OWBs must meet minimum setback requirements. Residential-size new OWBs (thermal output ratings of 250,000 British thermal units per hour (Btu/h) or less) must be sited 100 feet or more from the nearest property boundary line. Commercial-size new OWBs (thermal output ratings greater than 250,000 Btu/h) must be sited 200 feet or more from the nearest property boundary line, 300 feet from the nearest property boundary line of a residentially-zoned property and 1,000 feet or more from a school. 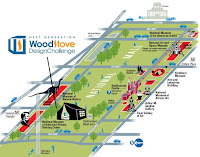 Under final-form subsection (d), regarding setback requirements for new Phase 2 outdoor wood-fired boilers, a person may not install, use or operate a new Phase 2 OWB unless the boiler is installed a minimum of 50 feet from the nearest property line. Rule R307-208. Outdoor Wood Boilers. (2) No person shall operate an outdoor wood boiler within 1000 feet of a private or public school, hospital or day care facility. (3) Setback. A new residential outdoor wood boiler shall not be located less than 100 feet from the nearest property boundary line. A new commercial outdoor wood boiler shall not be located less than 200 feet from the nearest property boundary nor 300 feet from a property boundary of a residentially zoned property. 7 (1) In this section, "installed" means installed outdoors or m a structure not ordinarily used as living space. (b) in any other case, not less than 80 m [262 feet] from each of the parcel's boundaries. (b) installed not less than 40 m from each of the parcel's boundaries. (4) Despite subsections (2) (a) and (3), if the certified boiler is designed to bum only pelletized fuel, the boiler must be installed not Jess than I0 m [32 feet] from each of the parcel's boundaries. (5) A person must not operate a boiler installed contrary to subsection (2) (a) or (b), (3) or (4). (6) On and after November 1, 2026, a person must not operate an installed boiler unless the boiler is a certified boiler or a phase 2 qualified boiler.